Pope Nicholas III (Latin: Nicolaus III; c. 1225 – 22 August 1280), born Giovanni Gaetano Orsini, was Pope from 25 November 1277 to his death in 1280. He was a Roman nobleman who had served under eight popes, been made Cardinal-Deacon of St. Nicola in Carcere Tulliano by Pope Innocent IV (1243–54), protector of the Franciscans by Pope Alexander IV (1254–61), inquisitor-general by Pope Urban IV (1261–64), and succeeded Pope John XXI (1276–77) after a six-month vacancy in the Holy See resolved in the papal election of 1277, largely through family influence. The future pope, Giovanni Gaetano Orsini, was born in Rome, a member of the prominent Orsini family of Italy, the eldest son of Roman nobleman Matteo Rosso Orsini by his first wife, Perna Caetani. His father was Lord of Vicovaro, Licenza, Bardella, Cantalupo, Roccagiovine, Galera, Fornello, Castel Sant’Angelo di Tivoli, Nettuno, Civitella, Bomarzo, San Polo and Castelfoglia, of Nerola from 1235; Lord of Mugnano, Santangelo and Monterotondo; Senator of Rome 1241-1243. His brother Giordano was named Cardinal Deacon of San Eustachio by Nicholas III on 12 March 1278. His brother Gentile became Lord of Mugnano, Penna, Nettuno and Pitigliano. Another brother, Matteo Rosso of Montegiordano, was Senator of Rome (probably) in 1279, War Captain of Todi, and Podestà of Siena in 1281. There were five other younger brothers and two sisters. The Orsini family had already produced several popes: Stephen II (752-757), Paul I (757-767) and Celestine III (1191-1198). He did not, as some scholars used to think, study at Paris—though his nephew did. His career shows no indication that he was a legal professional or a theologian. He never became a priest, until he became pope in 1277. Giovanni Gaetano Orsini was one of a dozen men created a Cardinal by Pope Innocent IV (Sinibaldo Fieschi) in his first Consistory for the creation of cardinals, on Saturday, May 28, 1244, and was assigned the Deaconry of San Nicola in Carcere. He was a Canon and Prebendary of York, and also of Soissons and Laon  In the summer of 1244, he was one of five cardinals who fled to Genoa with Pope Innocent IV. He was at Lyons, and was present in June and July for the Ecumenical Council of Lyons. Cardinal Orsini and the Curia did not return to Italy until May 1251—after the death of Emperor Frederick II Hohenstaufen. After spending the summer in Genoa, Milan and Brescia, they finally reached Perugia in November 1251, where the Papal Court resided continuously until April 1253. The Curia returned to Rome in mid-October, where Pope and Curia resided continually until the end of April, 1254. In May they went on pilgrimage to Assisi, then visited Anagni, where the Court stayed from June until the second week in October, when they went off in pursuit of Manfred, the claimant to the Hohenstaufen imperial crown. 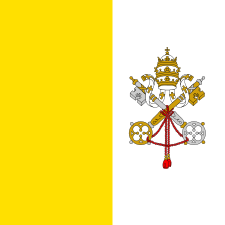 At the beginning of December, the Battle of Foggia took place, and the papal army was routed. Innocent IV died in Naples, where he had taken refuge, on 7 December 1254, and the meeting to elect his successor was therefore held in Naples in the palace in which he had died. Voting began on Friday, 11 December, with ten of the twelve cardinals present, but no candidate received the required votes. But on Saturday, 12 December, Cardinal Rinaldo dei Conti di Segni, the nephew of Pope Gregory IX, who had a reputation of a conciliator, was elected pope. He chose to be called Alexander IV and was crowned on Sunday, December 20, 1254, in the Cathedral of Naples. As for Cardinal Giovanni Gaetano Orsini, in his first eleven and a half years as a cardinal, he had only spent six months in the city of Rome. A peripatetic Curia had its disadvantages. 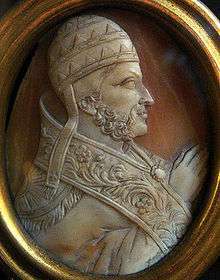 Pope Alexander IV and the Curia continued to live in Naples, until the first week of June 1255 when they returned to Anagni, and it was not until mid-November that the Pope was back in Rome. There the Curia stayed until the end of May, 1256, when it was off to Anagni for the summer, until the beginning of December. The problem was that Rome was in the hands of Senator Brancaleone degli Andalo, Count of Casalecchio, since 1252, and the Ghibbelines and Alexander was repeatedly driven out by unruly mobs. Rome was home again until the end of May, 1257, until the summer vacation at Viterbo began. The vacation lasted until the end of October, 1258, when the Court visited Anagni again; they stayed until the beginning of November, 1260. The Pope then was able to reside at the Lateran until the first week of May, 1261, when the Court was off to Viterbo again. Alexander IV died at Viterbo on 25 May 1261. A total of nineteen months was spent in Rome, out of a total of seventy-eight months. Alexander had created no new cardinals, and so the Electoral meeting following his death had only eight participants. The Election was a long-drawn-out one, lasting from 25 May to 29 August 1261. Unable to agree on one of themselves, the Cardinals chose Jacques Pantaléon, the Latin Patriarch of Jerusalem, who, since 1255, was Papal Legate with the Crusade in the Holy Land. He became Pope Urban IV, and was crowned at Viterbo on 4 September 1261. Cardinal Orsini was named General Inquisitor by Urban IV on November 2, 1262, the first known Grand Inquisitor. Cardinal Orsini attended the first Conclave of 1268-1271, and was one of the cardinals who signed the letter of complaint against the authorities and people of Viterbo for their treatment of the cardinals and the Curia. He was one of the six cardinals who were chosen by the rest of the Sacred College on September 1, 1271, to select a compromise candidate for election as pope. He was therefore instrumental in bringing to the papal throne the Archdeacon of Liège, Teobaldo Visconti, who was not a cardinal, and who was not even in Italy, but in the Holy Land on crusade. He traveled with the Curia to France in 1273, and was present at the Ecumenical Council of Lyons. He was not one of the cardinals in the suite of Pope Gregory X when he left Lyons in 1275 to return to Rome, nor was he at Arezzo where the Pope died on 10 January 1276, before reaching the City. He did not attend the first conclave which began on 20 January 1276, and concluded the next day with the election of Peter of Tarantaise, who became Pope Innocent V. Pope Innocent V (Peter of Tarantaise) died in Rome at the Lateran, on 22 June 22, 1276. The second Conclave of 1276 began, therefore, according to the rules set down by Pope Gregory X, on July 2. Thirteen cardinals were present, including Giovanni Gaetano Orsini. King Charles I of Sicily acted as the Governor of the Conclave, in which position he is said to have been rigorous, but understandably partisan in favor of the French faction. Cardinal Ottobono Fieschi of Genoa was elected on July 11 and chose the name Pope Adrian V. He lived only thirty-nine days longer, dying at Viterbo, where he had gone to meet King Rudolf and avoid the summer heat of Rome. According to Bernardus Guidonis, he was never ordained priest, consecrated bishop or crowned pope (nondum promotus in sacerdotem nec coronatus nec consecratus). His one memorable act was to suspend the Constitution of Gregory X "Ubi periculum" which regulated conclaves. He intended, on the advice of his cardinals, to improve Gregory's regulations. Cardinal Orsini was present at the discussion and decision. Shortly after his accession, moreover, Pope Adrian V had wanted King Charles I of Sicily to come to Viterbo to carry out the usual fealty, and sent the Suburbicarian Bishop of Sabina (Bertrand de Saint Martin); Cardinal Giovanni (Orsini), Cardinal Deacon of Saint Nicholas in Carcere Tulliano; and Cardinal Giacomo (Savelli), Cardinal Deacon of Santa Maria in Cosmedin, to effect his wishes. Charles arrived in Viterbo from Rome on July 24. Unfortunately, Pope Adrian died, on August 18, leaving his negotiations with King Charles unfinished. The third Conclave of 1276 began at the beginning of September in Viterbo, where Adrian V had died. The opening ceremonies, which should have taken place on August 29, had to be delayed for several days because of the riotous behavior of the people of Viterbo. Since Pope Adrian had created no new cardinals, the number of cardinals was twelve; Cardinal Simon de Brion was still in France, serving as Papal Legate. Once the tumults had been put down, however, the cardinals did their business quickly. On September 8, 1276, the senior Cardinal-Bishop, Peter Julian of Lisbon, was elected on the first ballot. He chose to be called John XXI, and on September 20 he was crowned at the Cathedral of San Lorenzo in Viterbo by Cardinal Giovanni Caetano Orsini. Since John XXI was already a bishop, there was no ordination or consecration necessary. He was the fourth pope of 1276. On 18 October, Cardinal Giovanni Gaetano Orsini was appointed Archpriest of St. Peter's, in place of Cardinal Riccardo Annibaldi, who had recently died, and who may have been too ill to participate in the Conclave or the Coronation. Pope Adrian V's suspension of the regulations of Gregory X, however imperfect they may have been, was under attack. Some critics even claimed that the cardinals who vouched for the truth of the suspension, including Cardinal Peter Julian, were liars, or that the revocation was uncanonical. These were probably the same troublemakers in the Curia who had instigated the disturbances that delayed the Conclave. John XXI immediately struck back, on 30 September 1276, making it perfectly clear that the suspension had taken place and that it was valid. Ptolemy of Lucca states that the issue of this bull of revocation by John XXI was made at the suggestion of Cardinal Giovanni Caetano Orsini. The negotiations which Cardinal Giovanni Caetano had been engaged in with King Charles I were brought to a completion, and Charles swore his oath of fealty to Pope John on 7 October 1276. It appeared that his reign was going to be a successful one, when one day in mid-May 1277, while the Pope was in a new room which he had just had built in the Episcopal Palace in Viterbo, suddenly the roof caved in. There was nothing suspicious about this, since the palace had been under construction since 1268 and was still being worked on. The Pope was severely injured from the falling stones and timber. He lingered in pain for several days (three, or six), and died on 20 May 1277, exactly eight months after his coronation. He had named no cardinals. Yet another Conclave took place in Viterbo, therefore, with seven cardinals in attendance. Cardinal Simon de Brion was still in France as papal legate. But this was not an easy conclave. Three of the electors belonged to the Angevin faction, and three opposed it. The only surviving Cardinal-Bishop, the Benedictine Bertrand de Saint Martin, wavered back and forth, providing little leadership. The Conclave therefore went on for more than five and a half months. Finally, on the Feast of S. Catherine, 25 November 1277, Cardinal Giovanni Gaetano Orsini was elected. He chose the name Nicholas III. The new pope set out immediately for Rome. He was ordained a priest on December 18, consecrated a bishop on December 19, and crowned on the Feast of S. Stephen, 26 December. His election portended serious difficulties, for he was not a candidate of King Charles of Sicily. Quite the contrary, he believed that King Charles had entirely too much influence in church affairs and in the operation of the Papal States. The lands of S. Peter were in a terrible position. In the second quarter of the thirteenth century they were threatened by the expansionist policies of the Emperor Frederick II, who was trying to unite his inheritance in the south (Sicily and southern Italy) with his acquisition of the German Empire in northern Italy. He spent a great deal of time and energy attempting to gain control over Lombardy and Tuscany, which brought him into direct conflict with the Papacy. Frederick was repeatedly excommunicated by one pope after another. In order to drive off the Hohenstaufen, the Papacy contrived a deal with the brother of Louis IX of France, Charles of Anjou, Count of Provence, who was invited to Italy to assume the crown of Sicily and be a counterweight against the Empire. He was too successful, however, and the Papacy found itself in the deadly embrace of the Angevins. Nicholas' prime goal was to loosen Charles I's grip on the Papacy, Rome, and the lands of the Church. Nicholas' pontificate, though brief, was marked by several important events. He greatly strengthened the papal position in Italy. On 1 October 1273, Rudolph I of Habsburg, the godson of Frederick II, had been elected King of Germany and King of the Romans. Pope Gregory X had recognized him as King, after some hard negotiation, but the imperial title and coronation were withheld. Pope Nicholas was willing to negotiate, but he refused to crown Rudolf as Emperor until Rudolph had acknowledged all the claims of the Church, including many that were quite dubious. The concordat with Rudolph I of Habsburg was concluded in May 1278. In it the city of Bologna, the Romagna, and the exarchate of Ravenna were guaranteed to the papacy. According to the chronographer Bartholomew of Lucca (Ptolemy of Lucca), he discussed with Rudolph, in general terms at least, the splitting the German empire into four separate kingdoms - Lombardy, Burgundy, Tuscia and Germany - where Rudolph's kingdom would be made hereditary and he himself would be recognized as Holy Roman Emperor. Nicholas III was even able to persuade King Charles I of Naples and Sicily to give up his position as Roman Senator in 1278, at the conclusion of ten years of tenure, as well as the position of Papal Vicar for Tuscany. In July 1278, Nicholas III issued an epoch-making constitution for the government of Rome, Fundamenta militantis  which forbade foreigners from taking civil office. It depends for its justification not only on the biblical phrase, "Tu es Petrus, et super hanc petram aedificabo ecclesiam meam" (Matthew 16:18), but also on the forged Donations of Constantine. Nicholas' father had been a personal friend of Francis of Assisi, and he himself had to focus much of his attention on the Franciscan order. More than 165 of his bulls and letters address the subject. Most importantly, he issued the papal bull Exiit qui seminat  on 14 August 1279, to settle the strife within the order between the parties of strict and relaxed observance. He repaired the Lateran Palace and the Vatican at enormous cost, and erected a beautiful country house at Soriano nel Cimino near Viterbo, where he died of a cardiovascular event (sources differ on whether it was a heart-attack or a stroke). Nicholas III, though a man of learning noted for his strength of character, was known for his excessive nepotism. He elevated three of his closest relatives to the cardinalate and gave others important positions. This nepotism was lampooned both by Dante and in contemporary cartoons, depicting him in his fine robes with three "little bears" (orsatti, a pun on the family name) hanging on below. 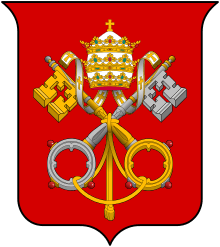 After the death of Nicholas III, in December, 1316, his namesake Giovanni Gaetano Orsini was appointed a cardinal by Pope John XXII. This was not, of course, a case of nepotism. John XXII, was nonetheless a nepotist, having appointed five of his nephews to the cardinalate. Ordonho Alvares, Archbishop of Braga – named Cardinal-Bishop of Frascati, † 21 December 1285. Bentivenga da Bentivengi, O.F.M., Bishop of Todi – named Cardinal-Bishop of Albano, † 25 March 1289. Robert Kilwardby, O.P., Archbishop of Canterbury – named Cardinal-Bishop of Porto and S. Rufina, † 12 September 1279. Gerard de Lessines, Bishop of Auxerre – named cardinal-bishop of Palestrina, † 18 July 1278. Gerardo Bianchi – named Cardinal-Priest of SS. XII Apostoli, then cardinal-bishop of Sabina (12 April 1281), † 1 March 1302. Giordano Orsini, brother of Pope Nicholas III – named Cardinal-Deacon of S. Eustachio, † 8 September 1287. Giacomo Colonna – named Cardinal-Deacon of S. Maria in Via Lata; excommunicated and deposed on 10 May 1297, restored as Cardinal-Deacon without a title on 15 December 1305, † 14 August 1318. Most of these new Cardinals were not of the French party, and among them were five members of religious orders. Two died before the next Conclave, which was to take place on the death of Nicholas III in 1280, and the rest had to be terrorized into voting for a candidate of Charles I of Sicily. Pope Nicholas III was stricken ill quite unexpectedly. The Curia was residing at the time in the city of Viterbo. Pope Nicholas was at his country retreat at Castro Soriano. According to the Chronicon Parmense he was suddenly deprived of consciousness and movement (privatus subito omni sensu et motu). Bartholomeus (Ptolemy) of Lucca says, subito factus apoplecticus, sine loquela moritur ('suddenly stricken with apoplexy, he died without speaking'). Nicholas was unable to make his confession, and died at his palace at Castro Soriano, in the diocese of Viterbo, on 22 August 1280. He had been pope for two years, eight months, and twenty-eight days. His remains were taken to Rome, where he was buried in the Vatican Basilica, in the Chapel of S. Nicholas. There was an alternative story circulating, as was frequently the case in the sudden deaths of medieval and renaissance popes—that the pope had been poisoned. This can safely be discounted. Dante, in The Inferno (of the Divine Comedy), talks briefly to Nicholas III, who was condemned to spend eternity in the Third Bolgia of the Eighth Circle of Hell, reserved for those who committed simony, the ecclesiastical crime of paying for offices or positions in the hierarchy of a church. In Dante's story, the Simoniacs are placed head-first in holes, flames burning on the soles of their feet (Canto XIX). Nicholas was the chief sinner in these pits, which is demonstrated by the height of the flames on his feet. At first he mistakes Dante for Pope Boniface VIII. When the confusion is cleared up, Nicholas informs Dante that he foresees the damnation (for simony) not only of Boniface VIII, but also Clement V, an even more corrupt pope. ↑ George L. Williams, Papal Genealogy: The Families and Descendants of the Popes, (McFarland & Company Inc., 1998), 36. Richard Sternfeld, Der Kardinal Johann Gaëtan Orsini, in a separate Excursus I, pp. 315-316, argues for a date of birth around 1216. He points out that one must take into account that Giovanni Gaetano's mother was a first wife. ↑ Richard Sternfeld, Der Kardinal Johann Gaëtan Orsini, p. 1. ↑ Matteo Rosso Orsini was a member of the Third Order of S. Francis (Tertiary): Richard Sternfeld, Der Kardinal Johann Gaëtan Orsini, p. 2. It was Giovanni Gaetano's father, also called Matteo Rosso Orsini ('Il Grande'), who, as Senator of Rome, locked the Cardinals up in a sort of proto-conclave in August, 1241. Ryccardus de S. Germano, Chronica. ↑ Williams, Papal Genealogy, p. 215. ↑ Demski, p. 7. Sternfeld, p. 3, n. 8. ↑ Conrad Eubel, Hierarchia catholica medii aevi I, editio altera (Monasterii 1913), p. 7. A. Demski, Papst Nikolaus III. Eine Monographie (Münster 1903), p. 8 and n. 2. ↑ Demski, p. 9 n. 2. ↑ August Potthast, Regesta Pontificum Romanorum II (Berlin 1875), 11459-11460 (September 27–28, 1244); A. Demski, Papst Nikolaus III. Eine Monographie (Münster 1903), p. 9. ↑ Potthast, no. 11518 (July 23, 1145). ↑ Potthast, no. 11729 (July 15), no. 11749 (July 23), and no. 11750 (July 24). ↑ A. Parracivini Bagliani, "La mobilità della curia romana nel secolo XIII. Reflessi locali," in Società e istituzioni dell' Italia communale: l' esempio di Perugia (Secoli XII-XIV) (Perugia 1988) 155-278. ↑ Adams, Dr. J. P. "Sede Vacante and Election, December 1254". ↑ Gregorovius History of the City of Rome in the Middle Ages V.1, 280-299; 310-311; 317-324, Karl Hampe, Urban IV und Manfred (1261-1264) (Heidelberg: Carl Winter 1905), p. 13. Giuseppe Rovere, Brancaleone degli Andaló senatore di Roma: contributo alla storia del comune di Roma nel Medio Evo (Udine 1895). Girolamo Giuliani, Il comune di Roma sotto il senatorato di Brancaleone degli Andalò (1252-1258) (Roma 1957). ↑ Adams, Dr. J. P. "Sede Vacante and Election, May—August, 1261". ↑ Fr. Joannis Hyacinthi Sbarale,Bullarium Franciscanum II, p. 453; Potthast, no. 18422. ↑ J. B. Sägmüller, Thätigkeit und Stellung der Kardinale bis Papst Bonifaz VIII. (Freiburg im Breisgau: Herder 1896) p.111. ↑ Adams, Dr. J. P. "Sede Vacante and Conclave of November, 1268—1 September, 1271". ↑ Adams, Dr. J. P. "The Conclave of 20-21 January, 1276". ↑ Gregorovius, pp. 474-475. Demski, pp. 34-37. Sternfeld, pp. 251-263. ↑ Adams, Dr. J. P. "Sede Vacante and Conclave, June—July, 1276". ↑ "Life of Adrian V," in Ludovico Muratori, Rerum Italicarum Scriptores III, 605. ↑ F. Cristofori, Le tombe dei pape in Viterbo (Siena 1887), p. 175. ↑ Adams, Dr. J. P. "Sede Vacante and Conclave of August—September, 1276". ↑ A. Theiner (ed. ), Caesaris Baronii Annales Ecclesiastici Tomus 22 (Bar-le-Duc 1870), under the year 1276, §29, p. 376. ↑ Demski, 33 n, 3. ↑ Sources are cited by Potthast, at p. 1718. ↑ Demski, pp. 35-37. Sternfeld, pp. 288-300. ↑ F. Gregorovius, History of Rome in the Middle Ages, Volume V.2 second edition, revised (London: George Bell, 1906) pp. 475-481. ↑ Johann Lorenz Mosheim, Institutes of Ecclesiastical History, Ancient and Modern Vol. II (New York 1839), p. 296. A. Theiner, Codex diplomaticus dominii temporalis S. Sedis I (Rome: Imprimerie du Vatican, 1861), pp. 228-243. ↑ Luigi Pompili Olivieri, Il senato romano I (Roma 1886), p. 198-199. ↑ A. Tomassetti (Editor), Bullarum Diplomatum et Privilegiorum Sanctorum Romanorum Pontificum Tomus IV (Turin 1859), pp. 42-45. ↑ Nicholas III (21 January 1997). "Exiit qui seminat". The Franciscan Archive. Retrieved 24 January 2013. ↑ Nicholas III. "Exiit qui seminat". 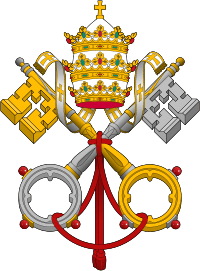 Papal Encyclicals Online. Papal Encyclicals Online webmaster. Retrieved 24 January 2013. ↑ Nicholas III. "Exiit qui seminat". Document Library. EWTN. Retrieved 24 January 2013. ↑ Maria Giulia Aurigemma and Alberto Caprani, Palaces of Lazio: from the 12th to the 19th century (Roma: NER 1991), pp. 180-181. ↑ Conradus Eubel, Hierarchia catholica medii aevi I, editio altera (Monasterii 1913), pp. 15-16. ↑ Conradus Eubel, Hierarchia catholica medii aevi I, editio altera (Monasterii 1913), pp. 9-10. The Cardinals of the Holy Roman Church. ↑ F. Gregorovius, History of Rome in the Middle Ages, Volume V.2 second edition, revised (London: George Bell, 1906) pp. 491-495. ↑ Ptolemy of Lucca Historia ecclesiastica XXIII. § 35. ↑ Annales S. Rudiberti Salisburgensis, in G. H. Pertz (editor), Monumenta Germaniae Historica Scriptorum Tomus IX (Hannover 1851),p. 806. ↑ Prue Shaw, Reading Dante: From Here to Eternity (New York: W.W. Norton, 2014), pp. 45-51. ↑ Charles T. Davis, "Simoniacs," in Allen Mandelbaum, Anthony Oldcorn, Charles Stanley Ross (editors and contributors), Lectura Dantis: Inferno (Berkeley-Los Angeles: University of California Press, 1998), pp. 262-274. Jules Gay (editor), Les registres de Nicolas III (1277-1280): Nicolaus III. Recueil des bulles de ce pape publiées et analysées d'après les manuscrits originaux des archives du Vatican (1898) (Bibliothèque des Écoles françaises d'Athènes et de Rome Sér. 2, Volume 14). A. Demski, Papst Nikolaus III. Eine Monographie (Münster 1903). Richard Sternfeld, Der Kardinal Johann Gaëtan Orsini (Papst Nikolaus III) 1244-1277 (Berlin 1905). Ferdinand Gregorovius (tr. Annie Hamilton), History of the City of Rome in the Middle Ages Volume V, part 2 (London: George Bell, 1906), pp. 477–491. Daniel Waley, The Papal State in the Thirteenth Century (London: Macmillan 1961), pp. 189–201. F. Elizondo, "Bulla "Exiit qui seminat" Nicolai III (14 Augusti 1279)," Laurentianum 4 (1963), pp. 59-119. Charles T. Davis, "Roman Patriotism and Republican Propaganda: Ptolemy of Lucca and Pope Nicholas III," Speculum 50 (1975), pp. 411–433. F. Allegrezza, Organizzazione del potere e dinamiche familiari. Gli Orsini dal Duecento agli inizi del Quattrocento (Roma 1998), pp. 15–6, 19-22, 36-41. S. Carocci, Il nepotismo nel medioevo. Papi, cardinali e famiglie nobili (Roma 1999), pp. 124–127. Kristin A. Triff, "Rhetoric and Romanitas in Thirteenth-Century Rome: Nicholas III and the Sancta Sanctorum," Artibus et Historiae Vol. 30, No. 60 (2009), pp. 71–106. Erika Starr Nelson, The religious, political, and personal aspirations of Pope Nicholas III in the frescoes at Old St. Peter's and the Sancta Sanctorum (Austin TX, USA: University of Texas at Austin, 2002). This article incorporates text from a publication now in the public domain: Chisholm, Hugh, ed. (1911). "article name needed". Encyclopædia Britannica (11th ed.). Cambridge University Press. Article "Nicholas III" in Volume 19 (1911), p. 650 (a brief twenty lines by Carlton Huntly Hayes). New Advent: Catholic Encyclopedia: Pope Nicholas III. Article by Nicholas Weber, "Pope Nicholas III" The Catholic Encyclopedia. Vol. 11 (New York 1911).